Artist's conception of the Marvel Avengers S.T.A.T.I.O.N. exhibit in New York City in May 2014. 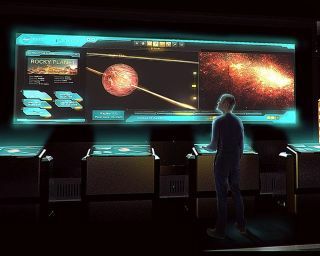 Pictured is the design concept for an exhibit with NASA's Eyes on Exoplanets. Whether you're from Earth or the planet Asgard, NASA wants you to face (fictional) armies from outer space. The space agency has teamed up with Marvel to created new training regime for recruits of Marvel's S.H.I.E.L.D. — a fictional league of superheroes — in an interactive display in New York City. The six-month exhibit, entitled Marvel's Avengers S.T.A.T.I.O.N, premiered at Discovery Times Square May 30, and will be there for about six months. The Avengers universe is the main attraction of the exhibit, but NASA is providing a heavy dose of science fact for those interested in Iron Man's suit, how black holes act as energy sources or other topics. NASA will also prominently display its "Eyes On Exoplanets" visualization to show off real-life worlds beyond Earth, perhaps similar to Thor's Asgard. Astronaut John Grunsfeld, NASA associate administrator for science missions, speaks to guests at an opening reception for Marvel's Avengers S.T.A.T.I.O.N. NASA gave a helping hand to the 2012 Avengers movie, which opened at a fictional dark energy facility where scientists were working on a tesseract, a stone of unparalleled power. NASA's logo was featured prominently on a banner in the scene. "The thrill of exploring other worlds is not limited to the silver screen, and we're pleased to help bring some real NASA excitement to the project," Bert Ulrich, liaison for film and TV collaborations at NASA Headquarters in Washington, D.C. said in a statement. "We especially hope that young visitors will come away from this exhibit with an increased interest in science and technology." More information is available at http://stationexhibit.com/.